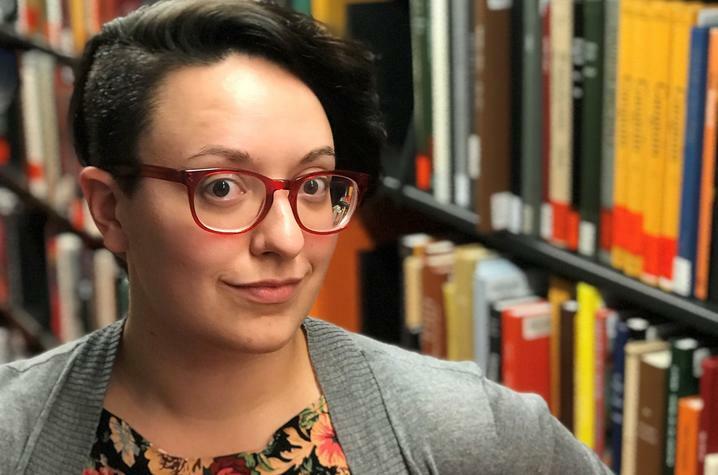 LEXINGTON, Ky. (Aug. 9, 2018) — Alex O’Keefe, a recent University of Kentucky library and information science graduate, joins the Robert B. Haas Family Arts Library and Yale Center for British Art Research Library at Yale University as a Samuel H. Kress Fellow in Art Librarianship. “I feel incredibly grateful to be chosen for this opportunity, because everything about it is exciting! This was the position I hoped for directly after finishing my degree because it is designed to help new art library professionals gain valuable experience in many areas,” O’Keefe said. O’Keefe earned her master’s degree in library science from UK’s School of Information Science, which is a part of the College of Communication and Information, in May. While in the library science program, O’Keefe focused her studies on art librarianship and digital collections management. She also interned at Smithsonian Libraries as part of the school’s alternative spring break program. The Kress Fellowship is a 10-month appointment and focuses on multiple areas of art librarianship including public services, collection development and management, special collections, and digital collections. “This was my first time interviewing for a librarianship position, and the interview process was built in a way that was similar to many academic librarian processes. It began with a cover letter and resume, followed by a brief phone interview, and concluding with an all-day, in-person interview at the Robert B. Haas Family Arts Library at Yale. It did not require a presentation like other academic librarian interviews might, but it had many layers of interviews so that I ultimately met all staff members from the Haas Arts Library and Yale Center for British Art Research Library present that day,” O’Keefe said. Projects and activities will draw on subject areas served by the Haas Family Arts Library, Haas Arts Library Special Collections, and the Library and Archives of the Yale Center for British Art including the history of art, architecture, drama and aligned area studies.